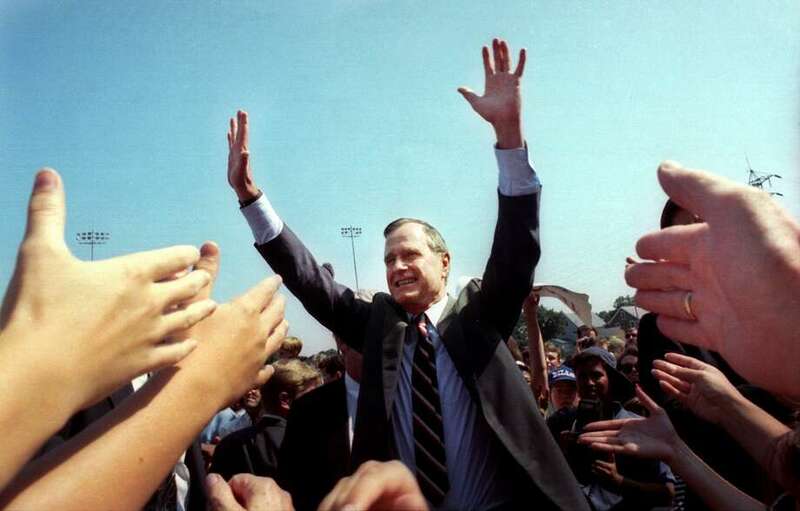 President George H. W. Bush greets the crowd gathered at Nolan Field in Ansonia, Conn. Aug. 24th, 1992. Congressman, CIA director, envoy to China, ambassador to the United Nations. George Herbert Walker Bush wore all of those titles in a political career of uncommon accomplishment. Before them all, he was simply “Poppy” to family and friends in Greenwich. Bush died Friday at the age of 94 — less than eight months after his wife, Barbara Bush. Not exactly a native son — he was born in Milton, Mass., on June 12, 1924 — George H.W. Bush came to Greenwich as an infant. He grew up here, the second oldest of five siblings in a 1903 Victorian with a wraparound porch at 15 Grove Lane. In Greenwich, the future leader of the free world got his first taste of government service, watching his father moderate the Representative Town Meeting. It was here that a young boy’s brashness was sanded off, in lessons that could sting, and a Yankee humility instilled that would set him apart from Washington circles and endear him to millions of Americans. And it was in Greenwich that leadership qualities first took root and began to grow, qualities that would carry him to acclaim on the playing field and in the military, and to the most powerful seat on the planet. His parents sent the young George, by limousine, to Greenwich Country Day School, where a note from his fifth-grade teacher on his report card proved to be prophetic. “One day, Bush will become a leader,” the teacher wrote. It was at Country Day that the young Bush first displayed the athletic ability for which he would become known. His favorite sports were soccer, football and baseball. “I just couldn’t wait to get out there when the games would start,” he told Rohdie. Some of his earliest life lessons were learned through sports, many of which came from his coach at Country Day, Unc Hillard. Bush was not just a force on the playing fields. He sang in an a cappella group known as the Double Octets and was often called upon to introduce the songs, which he credited with helping his public speaking. There was one problem with singing, however. “I couldn’t carry a tune,” he told Rohdie. The patriarch of the political clan was Prescott Bush Sr., a Yale-educated investment banker who honed his leadership skills as moderator of the RTM for 17 years before going on to serve in the U.S. Senate for 11 years. The elder Bush, first elected to the Senate in 1952, became known for diplomatic talents that helped hold disparate factions of a fragmented Republican Party together, though among his noted acts was engineering Joseph McCarthy’s 1954 censure in the Senate. To this day, the state Republican Party’s highest honor is named for him. But by many accounts, the true leader of the household was Dorothy Walker Bush, the daughter of a prominent banker who was president of the United States Golf Association — the Walker Cup is named for him. She was active in the Red Cross in Greenwich and she was co-founder of the Greenwich Shelter for Children on Arch Street, which became Family Centers. But in an article he wrote for Greenwich Time in 1985, Bush painted a bit of a different picture of his mother. “You don’t have a game,” she shot back. “Well, George and I woke up, and we looked at each other and exploded with laughter,” Prescott told Greenwich Time in 1991. George wrote about what happened after that. After Country Day, Bush attended Phillips Academy Andover and, at 18, joined the U.S. Navy, earning the Distinguished Flying Cross as a Navy pilot in World War II. He also, at the age of 18 or 19, attended a Christmas dance at the Round Hill Club in Greenwich. There, he met a 16-year-old distant cousin of President Franklin Pierce who came from neighboring Rye, N.Y. Her name was Barbara Pierce. They tried to waltz together, but, as the story goes, he was not much of a dancer. Again, no matter. 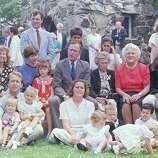 The marriage of George and Barbara Bush lasted 73 years, and bore six children. After the war, Bush returned to Connecticut, and enrolled in Yale University. There, he was a member of Phi Beta Kappa and captained and played first base for a baseball team that lost twice to California in the championship game of the College World Series, in 1947 and 1948. 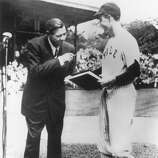 When Babe Ruth presented his papers to the school in 1948, they were received by the future president, in his baseball uniform on Yale’s diamond. Also at Yale, Bush was one of 15 juniors tapped for Skull and Bones, the university’s oldest and most secret senior society, in 1947. 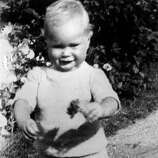 His father was a member before him, as would be his son, future President George W. Bush, after him. Members of Bush’s Bones class reunited in Washington while Bush was vice president, dining at the vice president’s mansion and touring the Oval Office. It was after Yale that Bush left Connecticut for Texas, and the oil industry. But he never cut his ties to Greenwich. Family, including his mother and older brother, still lived here, and he returned on occasion, even after attaining the highest of offices. One visit was as vice president in September 1986, when he flew in for a rally at Greenwich High School. Students from Greenwich High, Brunswick, Greenwich Academy, Convent of the Sacred Heart and the Daycroft School met him as he arrived at Westchester County Airport and rode in his limousine back to the school. When Bush ran for president in 1988, five Greenwich residents traveled to New Orleans to serve as delegates and alternates at the Republican National Convention. “There’s a special, warm bond of friendship he will have with the Connecticut delegation and many personal bonds,” said William Nickerson, then state representative from the 140th District. More than 180 members of the Bush extended family traveled to Washington for the 41st president’s inauguration. So did many friends from Greenwich. Some stayed there. Among the Greenwich residents who served in Bush’s administration were Joseph Verner Reed, White House chief of protocol; David George Ball, assistant secretary of labor; and former Greenwich Police Chief William Anderson, U.S. marshal. Bush did not get back often to town as president, but often enough that residents of Pheasant Lane, where Dorothy Bush lived later in life, came to know the sound of the 25-vehicle presidential motorcade rumbling down their narrow road. 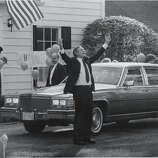 Shortly before he left office, Bush returned to Pheasant Road, and Christ Church, for his mother’s funeral in 1992. 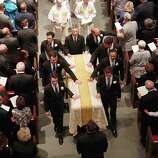 Eight years ago, the ex-president, then 86, returned to Christ Church once again, making a low-key entrance through the side door of the sanctuary with an entourage of Secret Service agents in tow, and sitting in the third row of pews during a memorial service to the older brother he knew as Pressy. Prescott Bush Jr. died June 23, 2010. Unlike his father and younger brother, Prescott Jr. lived most of his political life behind the scenes, helping others get elected. His boldest foray into the forefront came in a 1982 challenge to Lowell P. Weicker Jr.’s Senate seat, which he withdrew prior to that year’s primary in a show of party unity. “They are just a premier American family,” Reed, a lifelong friend of the former president’s who died in 2016, told Greenwich Time after Prescott Jr.’s death. That Bush, drawing on the early lessons from the playing fields and courts of Greenwich, did not wear the airs of a political scion turned out to be one of his great public strengths, though everyone didn’t always see it as such. It wasn’t to be. The Yankee stoicism that forbade bragging also disallowed any sign of self pity, which Bush would not show, not when he lost his re-election campaign to Bill Clinton in 1992, not when Parkinson’s disease took the use of his legs late in life. “He is a living example of grace and courage, regardless of the physical challenges that he deals with daily,” Debbie Walker Stapleton, a first cousin of Bush and longtime Greenwich resident, said on his 90th birthday, which he marked by jumping out of an airplane, despite being confined to a wheelchair. That reputation, earned over decades of public service, suffered last year when several women accused him of groping their buttocks while posing for photographs. Bush’s staff at the time issued apologies and said the former president meant the actions as a joke, a motivation that sexual assault experts said matters little to those on the receiving end. Those who knew Bush best, and much of the country, could not reconcile the accusations with the man they knew.